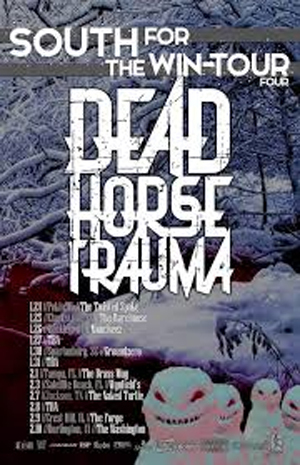 DEAD HORSE TRAUMA Announces "South For The WinTour 4"
DEAD HORSE TRAUMA is hitting the road for the last time this year in their fourth annual “South For The Wintour 4” before heading to Europe. This tour will be accompanied by hard-hitting locals from each area and will meet up with various touring bands along the way! ATTENTION: FREE Meet & Greet VIP Giveaway! We’re offering (2) FREE MEET & GREET VIP Ticket upgrades!